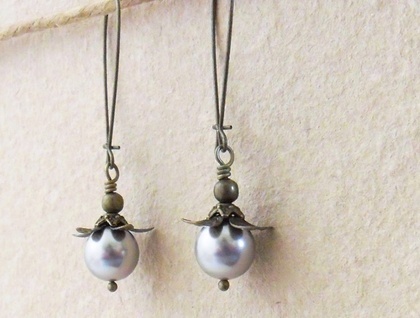 Fat, round, Swarovski imitation pearls in a pale, soft grey, topped with leafy, antiqued-bronze coloured bead-caps, dangle from elegantly arched ear-wires. Swarovski pearls are made by the makers of the famous Swarovski crystal, and have a crystal core that simulates the weight and feel of a real pearl. They are fade- and perfume-resistant, with a luxuriously smooth, flawless finish; and are generally regarded as the best imitation pearls on the market. These earrings are also available in other colours here in my Felt shop. 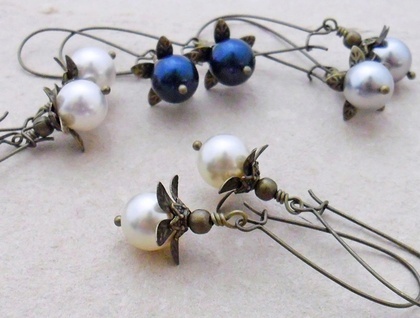 The 'Bursting Bud' earrings measure 56mm from top to bottom. 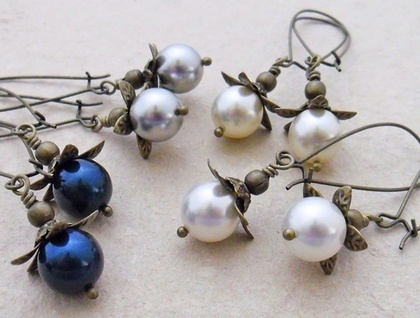 The faux pearls are 10mm in diameter, and the widest, leafiest bead-cap splays 15mm across at its widest. 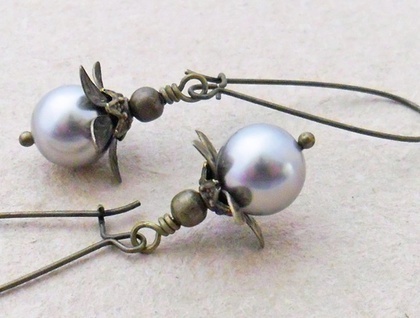 The ear-wires are brass based and are without nickel.